Yamhill County has the largest area planted to vineyards than any other county in Oregon, with over 80 wineries and 200 vineyards. Six of Oregon’s AVAs (American Viticulture Areas) are either completely or somewhat within Yamhill county: Chehalem Mountains AVA, Dundee Hills AVA, Eola-Amity Hills AVA, McMinnville AVA, Ribbon Ridge AVA, and Yamhill-Carlton District AVA – all a part of the larger Willamette Valley AVA. The county also boasts an impressive agricultural industry that includes horticulture, wheat, barley, dairy farming and thousands of acres planted to orchards; orchards that grow peaches like no place else on earth – more on this experience below. Dundee, population approximately 3200 and one of several small cities located in Yamhill County, is smack dab in the middle of Willamette Valley wine country – an area of rolling green hills that Oregon’s wine pioneers correctly foresaw would some day be lined with world-class vineyards planted to Pinot Noir, Chardonnay, Riesling and more. 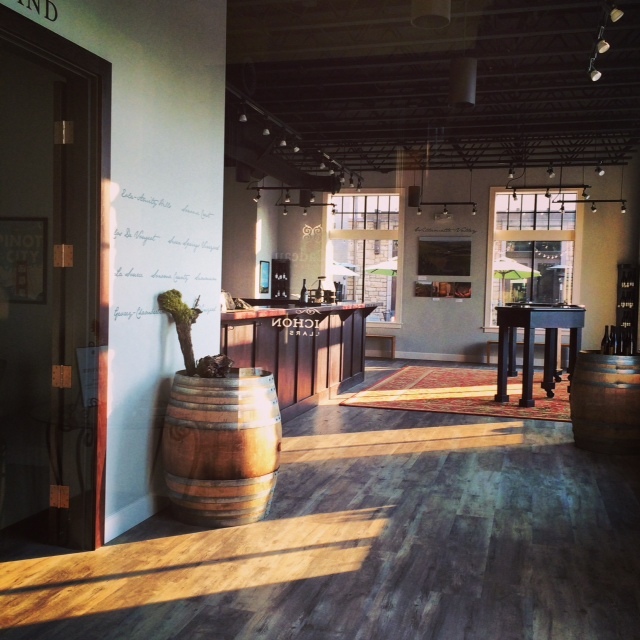 The main street (Highway 99w), that goes through Dundee’s bustling downtown is lined with world-class winery tasting rooms from one end to the other. Dotted among the tasting rooms are restaurants and bistros that embrace the farm-to-table approach, a market that proudly highlights wine country Oregon crafted gifts and farm-fresh foods, and Inns that are truly idealistic for wine enthusiasts visiting from around the world. The crossroads that connect to Highway 99 from the west of the bustling main street lead to the some of Oregon’s most world renowned estate vineyards and wineries that offer breathtaking views, where row after row of vines gracefully cover the foothills of the Oregon Coast Mountain Range. Staying at the Inn at Red Hills in Dundee has its benefits: Evening Land’s tasting room was directly below my room. Through YES’s innovative, collaborative and creative programs which work to incorporate Education & The Arts, Food & Agriculture and History & Community, Yamhill’s society is truly receiving notable significant and indispensable enrichment. Programs such as Books for Babies (focus on literacy age 0-5), Koncert for Kids (music enrichment for public schools), Nourish Yamhill Valley (building a robust local food economy), Living History (giving today’s generation a sense of the past), Women Leaders’ Luncheons (fostering inter-generational communication), and Bounty of the County (making Yamhill County a culinary destination while forwarding proceeds to the programs of YES). Saturday, September 6, the first day of the two day Bounty of Yamhill County event, participants could choose one of three farm tours: Briar Rose Creamery, Kookoolan Farms or a Biodynamic Vineyard Tour and Tasting at Bergström Wines. 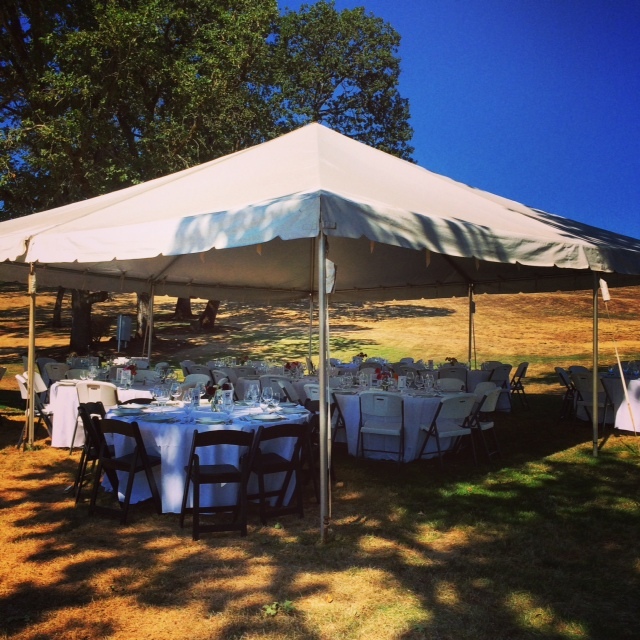 Meeting at the stunning Stoller Family Estate, where the buses for the farm tours would depart from and return to, we were able to get a glimpse of the area where we’d be having a gourmet picnic lunch provided by Bon Appétit Management Company upon our return from the tours. The farm tour I chose – you guessed it – was the Biodynamic Vineyard Tour and Tasting at Bergström Wines, which was led by the fourth of five Bergström children, Josh Bergström, who studied viticulture and enology in Burgundy, France, and is now the General Manager, Winemaker and Vineyard Manager of Bergström Wines. 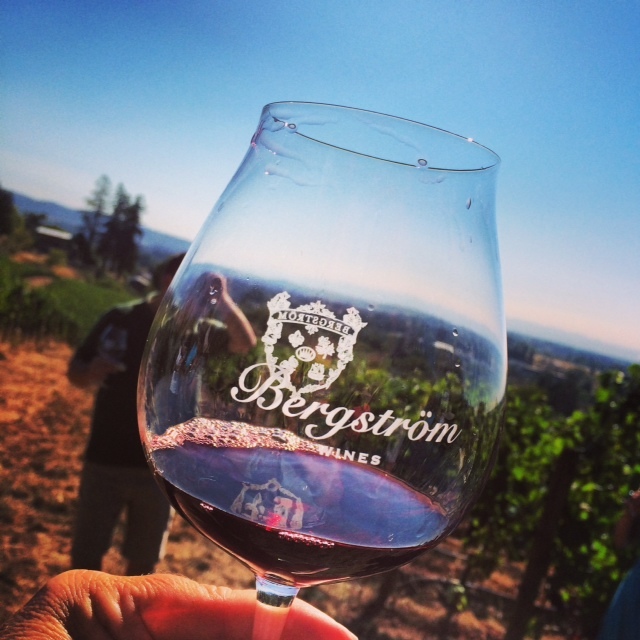 Bergström Vineyard is a 13 acre gently sloping south facing vineyard planted to Pinot Noir and Chardonnay that’s been farmed Biodynamically for 15 years. 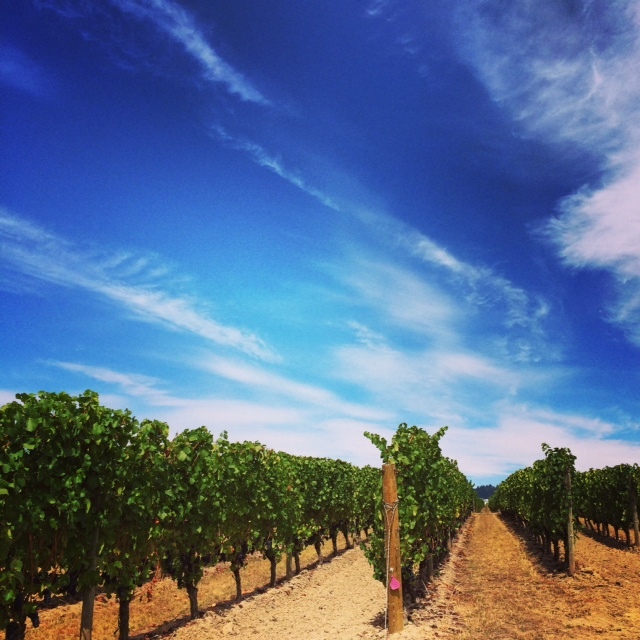 Since its inception, when Josh’s parents, John and Karen Bergström planted Bergström Vineyard in 1999, the operation has been family owned and run. Currently, Josh and his wife co-own Bergström Wines with his parents, and together they own five estate vineyards in the Willamette Valley totaling 84 acres. 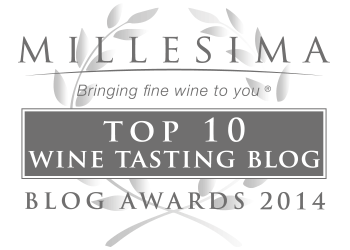 The Bergström wines are highly sought after, and they currently produce two Chardonnays, one of which I highly recommended in a recent Snooth article: Getting to know Julia Crowley, and nine Pinot Noirs. 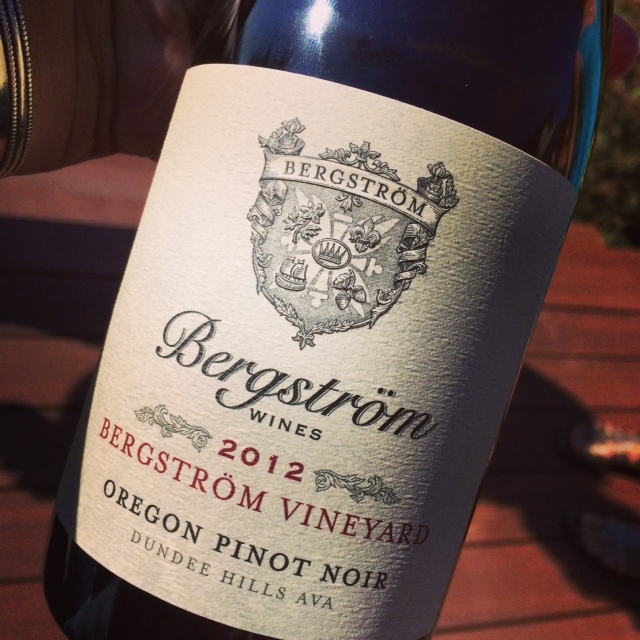 We tasted three vintages of Bergström Vineyards Pinot Noirs on the tour: a 2008, 2011 and 2012 – tasting notes can be found on Delectable.com. What was most impressive about the Bergström Vineyards tour was Josh’s ability to describe the practices of farming Biodynamically in a way that everyone on the tour clearly seemed to grasp. I witnessed many “aha” moments – while experiencing a few of my own, as well. When we returned to Stoller, a gourmet picnic lunch; along with, scrumptious appetizers, were perfectly paired with select wines from Stoller, including a delectable dessert of Brûléed Baird Farm peaches with vanilla poached blueberries served with a glass of the extraordinary 2013 Stoller Dundee Hills Single Acre Riesling. Not only was the Riesling out-of-this-world amazing, but so was the Brûléed peach dessert. The peach in the dessert was so delicious, I was yearning for far more. Lucky for me, the following evening I stumbled upon an opportunity to sneak a slice of peach that will not be forgotten. Unconventional and totally radical catering truck. Chef Jody of Red Hills Market paired up with Trevor Baird of Baird Family Orchards and cooked up a storm out of this beauty. 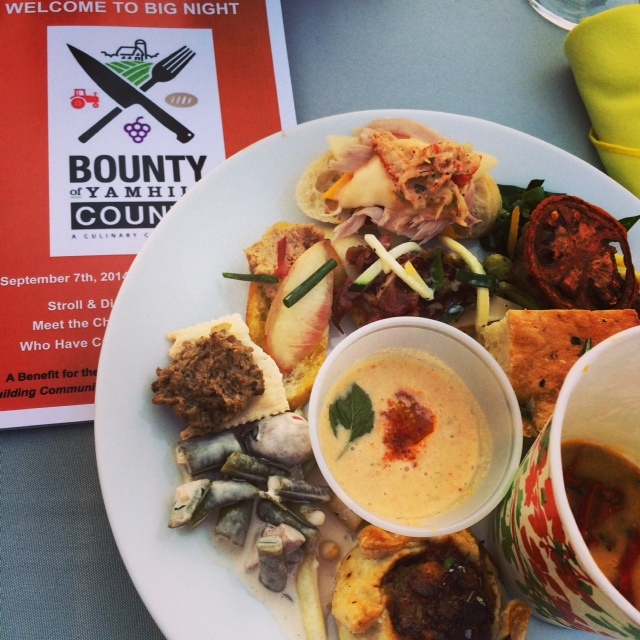 Sunday, day two of the Bounty of Yamhill County, was the BIG NIGHT: A Harvest Dinner featuring 20 farmers, 20 chefs and 20 vintners. 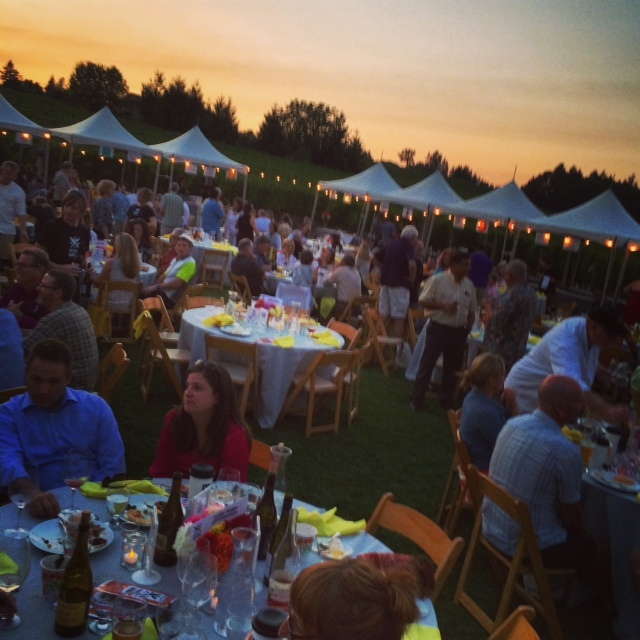 Taking place among the vines of the splendid Sokol Blosser estate vineyards, the BIG NIGHT was a culinary feast like none I’ve ever attended. Chefs from local restaurants prepared wholesomely exquisite small bites using freshly harvested foods from the farmers they were paired up with. Each chef and farmer beamed with pride as they slid their savory, succulent creations onto the dinner guests’ plates. 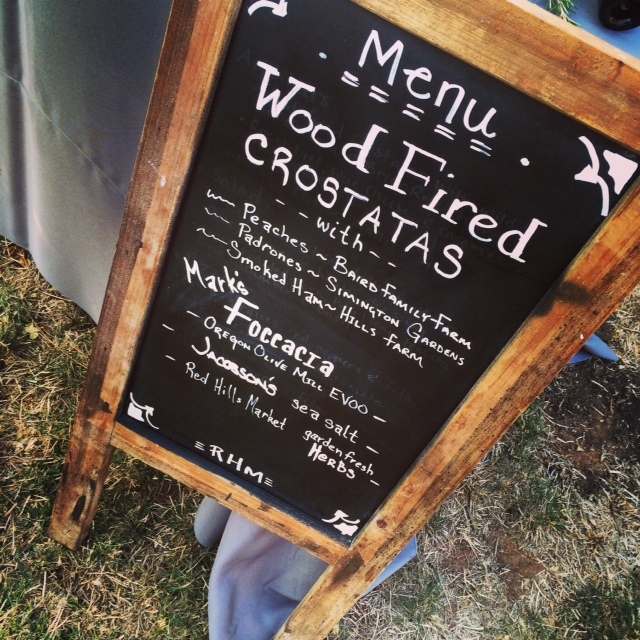 Tents were set up side by side in the shape of a large U, showcasing the farm-to-table smorgasboard with perfection. Table rounds with white linens, fresh-cut flower centerpieces and cheery yellow napkins were sprawled throughout the center of the larger than life outdoor gourmet buffet. But before we made our rounds from tent to tent to fill our plates with farm fresh fare, we signed-in at the registration table, received our table assignments, and immediately entered the line for the ever-popular Wall Of Wine. 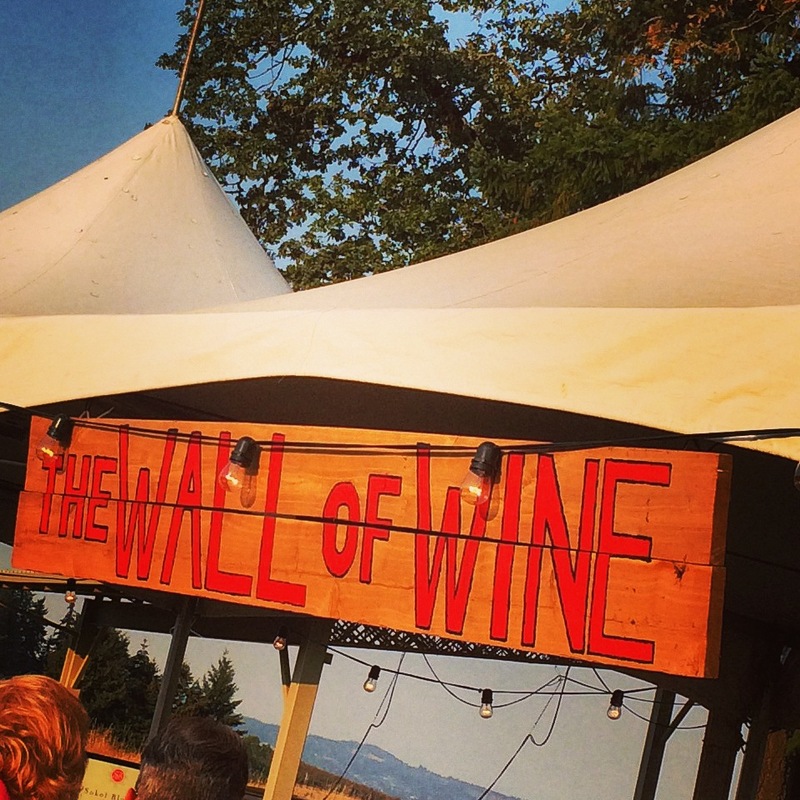 There’s good reason why The Wall of Wine is notably celebrated and certainly a crowd-pleaser: Each person attending the event has the option to purchase one to four bottles of wine for $25 dollars each or five for $100 dollars – but get this – they have no clue what wine they’ll be receiving when they hand over their money. And although the hundreds of donated bottles of wine are in plain view (The Wall of Wine), the person who just purchased wine does not know which bottle of wine they are going to receive – all they know is that what they will receive is worth more than what they paid – all wine retails between $30 dollars to over $100 dollars. As I stood in line and watched people pull numbered corks from a box, everyone would shout with glee as their numbered bottle was revealed and handed over to them – it was exciting! I was one of the super lucky wine buyers, when my bottle was revealed I let out a shout of glee when I realized I’d be taking home the 2009 Sokol Blosser Dundee Hills Pinot Noir (a special one I’m saving for Thanksgiving). 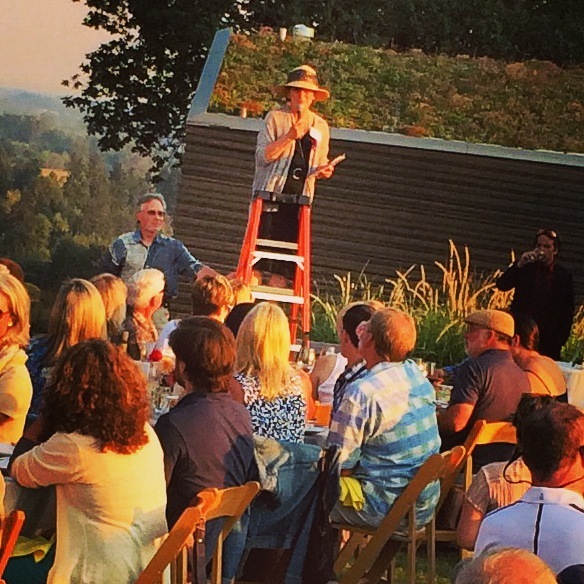 As Susan Sokol Blosser climbed atop a ladder so she could be seen and heard while delivering an eloquent speech regarding the purpose of the evening’s festivities, I was taken back by how quickly every single attendee, farmer, chef, or staff member immediately stopped what they were doing to listen – and listen they did. Not a peep was heard from the hundreds in attendance, their respect for Susan beamed as she proudly revealed the essence of the Yamhill Enrichment Society. Oh my goodness, the Baird Family Orchards peach – there’s nothing as sweet, or succulent, or juicy or scrumptiously divine as a peach from this family-owned Yamhill County orchard. Nothing. 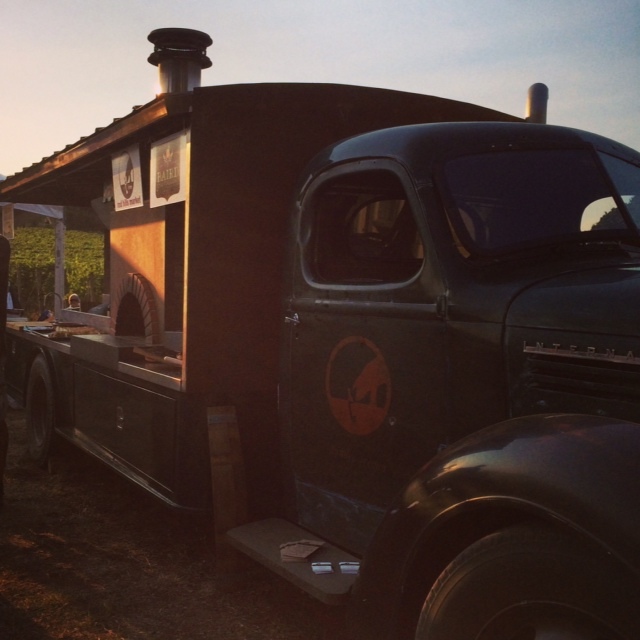 And lucky me, my table was right next to where Baird Family Orchards was paired up with the chef and owner of Dundee’s Red Hills Market, who is also the proud owner of the most incredible truck on planet earth. I just had to check out this truck, so as I selected one of their delicious wood-fired crostatas, I was able to get the attention of second generation orchard farmer, Trevor Baird, who gave me a first-hand look and tour. The bed of a late 40s International Truck was converted into a catering mega-machine. One side has a full on wood-fired oven, food prep areas including a sink and even a built-in storage bin for the fire wood. The back end has taps that come from a kegerator located inside a refrigerated portion of the truck on the other side, so kegged beer and wine can be served straight from a tap – actually three taps. While Trevor was showing me the truck, there just happened to be a pile of freshly fire-roasted peaches from Trevor’s family’s farm, Baird Orchards (the same farm where the peach in Day 1’s dessert came from). Unprepared for such a treat with no napkin or utensils, I just went for it with my my bare hands – juice slid down through my fingers all the way to my elbow. Just in the nick of time (before soiling my shirt with juicy peach deliciousness), I put the entire peach slice into my mouth. I’m sure some of the juice escaped my lips and rolled down my chin as my eyes rolled back into my head and thoroughly relished in its exquisiteness, but it didn’t seem to matter while temporarily visiting peach heaven. Just as I swallowed the last bit of peach, Susan Sokol Blosser whisked me away (sticky and all) to hear a fantastic story from a Kookoolan Farms fanatic. Somewhat similar to my own story of how I ended up back in Oregon after a 20 year hiatus in Florida, Chris Anderson, a fellow Oregon transplant from Florida moved here for many of the same reasons my family and I did. But he has a really fun story to tell. After Chris and his wife Leslie had visited here 23 years ago, they returned for their second Oregon visit in 2010, destination McMinnville. While driving through wine country, the sign for Kookoolan Farms caught their attention. As farm-share enthusiasts back east, they decided to stop and see what this roadside market had to offer. They expected to find the usual farm-fresh produce and natural dairy products, but what they didn’t expect to find was not a single staff person – a lone sign read “Help Yourself.” Where fresh vegetables, fruits, eggs and even freshly butchered meats were available for purchase, there was no locked cash register or person behind the counter ringing up sales, there was no credit card swiper or ATM. But what Chris and his wife did discover was an old fashioned honor system, where an unlocked cash drawer was available to customers for buying products who needed change for their $10, $20 or $50 dollar bill they would add into the cash box for the products they selected to take home. What really struck the hearts of both Chris, and especially his wife, was the IOU board – offering those that are struggling financially an opportunity to have fresh healthy food to fill their bellies during times that their wallets may not be filled at all. Chris’s wife Leslie was so touched by the trusting and kind acts of the Kookoolan Farms owners, that she was brought to tears; Chris and Leslie decided they wanted to make Oregon their home. Returning to Florida with a 2.5 year plan to move to Oregon, they did it. They are now living happily in Yamhill County, where Chris says, it’s not just the good fortune of living in the bountiful Oregon, but the good fortune of being surrounded by the generosity and benevolence of the good people of Oregon. 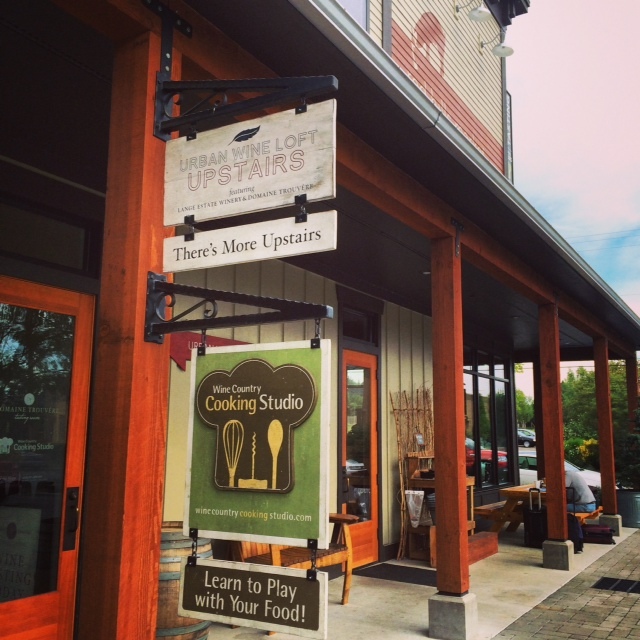 The event name, Bounty of Yamhill County, is especially significant not only because Oregon’s bounty rewards us with plenty of fresh, wholesome foods, but Oregon is brimming with kind, generous and good people. Great weather for the Big Night. Staying at the Inn at Red Hills – an unparalleled destination for a wine writer and enthusiast located in the heart of downtown Dundee – offered me the wonderful opportunity to visit impressive tasting rooms like Evening Land and Angela Estate, while imbibing in outstanding food and drink from the deliciously exquisite Babica Hen Cafe – without even ever leaving the Inn’s property. But when I did leave the property to explore a few other noteworthy landmark establishments of Yamhill County like Domaine Drouhin Oregon, Vista Hills, Adelsheim, Red Hills Market and The Republic of Jam, I realized I was going to be writing loads of articles over the next few weeks; each and every one of the places I visited and the people I met were individual gems and masterpieces that all have a significant impact on making Oregon the wonderful and amazing place it is. A very special thank you to the Oregon Wine Board, Sarah Lessen, Susan Sokol Blosser. And to Trevor Baird for that unforgettable peach.